i have been thinking about using aluminum for a bit and i was wondering how i could build a melting furnace for melting scrap aluminum. i was also wondering could u melt aluminum cans(soda cans, etc.) to make aluminum bars? We get a lot of soda cans every week, so i think we would have enough to make some small sized bars. also how much would it be to make a melting furnace for aluminum? i would like to use propane or possibly electric. we used to melt aluminum cans in a tin can in a campfire. It should be no problem in a propane fired forge. I am not sure what quality of bar you would get but its worth a try. contact moya034 on this site, he does aluminum casting. metalliferous does as well. Gingery wrote a whole series where he started by making a melting furnace for Al, (either propane or charcoal versions) and then by casting and hand work built a metal lathe, shaper, etc. Take a look through this site: melting metal in a home foundry, backyard metalcasting, metal casting. Lots of good information. if you can find some kind of ceramic pot place 2 fire brick under the pot to set it on and around it 3 brick's higher then the pot like a kiln then a large propane torch ,open up a hole on the side by moveing 2 or 3 bricks to set the torch in close to the bottom and then fire it up. Put all your aluminum in the pot before you heat it up ,Aluminum pours at 1200 deg. if you have a Foundry close to you ask if they have an old pot you could have and if they use hard sand made with "pep-set" fourms ask if you can have a large piece make a groove in it then pour your aluminum in it SLOW VERY SLOW. another question can u use cupcake trays as ingot molds? dont know about cupcake trays, but i know one thing... if your ingot mold is a little bit rusty, then your ingots wont stick to the mold as much as a clean surface. cupcake trays sound like a bad idea to me. they are just stamped together and could come apart with rapid heat change, spilling molten metal all over. so have a rusty mold? so it wont stick? easy to make ingot mold is pictured, just a bunch of angle iron welded in a V pattern. when working with molten metal, be sure you have ALL the safety gear you need. Get some GOOD protection for your arms. It was raining hard and just wanted to finish the pour (I work outside) and some hit on the outside of my elbows.. both of them. They actually got infected which wasn't fun. Other than that you look like your good to go. Might wanna get some chaps too though. Good luck with it. And a side note: you don't even need to heat it up when forging it always cracks when I heat it. I'v melted it in my forge before,wasn't hard at all.If you use cans crush them or they will burn,the best way is to get a little pool started with some thicker stuff like a old lawn chair and then add the cans. 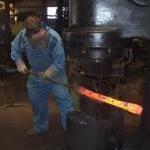 As for a crucible (pot for melting) you can weld a plate on the bottom of a pipe ,but it would need to be a water tite weld.And you do need to "season" it,bring the whole thing to red heat and set it out to cool slowly that will allow scale to form and keep the AL from eating it. As for cupcake pan for ingots,they use them alot over at the metal casting site so I guess they work ok.But I haven't tried it yet. Molten aluminum & water is a bad idea,don't do it in the rain or on wet pavment. cupcake pans work great for ingots. Aluminum explodes with 300 times the power of a similar molten iron explosion I would suggest preheating to drive all the moisture out of your scrap especially if you are using cans. Many aluminum factories around the world have been leveled this way. I'v melted it in my forge before, wasn’t hard at all. If you use cans crush them or they will burn, the best way is to get a little pool started with some thicker stuff like a old lawn chair and then add the cans. All due respect but this procedure is the exact recipe to cause a molten metal explosion. Cans and the little swig that you cant quite get are so dangerous that the aluminum plant that I work at will fire you on the spot for having an aluminum can on the property. Pre heated and dried out cans cause no real danger but adding a can that contained a teaspoon of liquid to already molten metal is would be like lighting a stick of dynamite. Please be careful when dealing with molten aluminum. A lot of people use coke cans and like for their casting. It works just fine. As long as you have the patience for the time it takes to crush and melt enough to have a substantial mass. You will have a lot of dross to scrape off, but like I said patience. I use almost strictly cans with the occasional oxygen cylinder(that'll raise hollers from the crowd I know, but I am safe). My furnace is large enough I can use it as a scrap melter placing metal right in the fire and tap from the bottom. Also, I use wood exclusively in this furnace and is totally free. Moulds are made for lead by companies like RCBS and Lyman who supply reloading equipment. They work fine on lead so should be OK unless anybody wants to correct me on this. the cast aluminum lead ingot molds arent designed to take the kind of heat that molten aluminum gives off.